You have to assume any New England building dating back to the Seventeenth Century must have been involved in witchcraft in some way. The historic Noyes-Parris House, former home of Rev. Samuel Parris of Salem Witch Trial infamy, is a good example. Fittingly, the early Colonial house serves as the central location of brothers Michael & Shawn Rasmussen’s old school The Inhabitant (trailer here), which releases today on iTunes. Despite the freakiness of Rose Stanton, the somewhat age-addled retiring proprietor, a married couple is delighted to buy the March Carriage bed & breakfast—and for such a reasonable price. Dan and Jessica Coffey believe it is an investment in their future, but they really did not poke around enough. If they had, they might have noticed the weird witchcraft paraphernalia in the cellar and the video surveillance monitors still functioning in the attic. They also might have been curious to learn Lydia March, a midwife accused of witchcraft, met her grisly end while living there. The first few days are filled with rustic charm, but when Dan is suddenly called away on business, he returns to find a radically different vibe. If only their dog Wiley could talk. Instead, he will have to look for answers in the surveillance tapes and the local witchcraft museum. There is no question the Noyes-Parris/March Carriage is an absolutely terrific location for a horror film. The Rasmussen Brothers fully exploit it, taking viewers into all sorts of dark rooms and passageways. The Inhabitants bears obvious comparison to Ti West’s The Innkeepers (some of his fans were down on it, but we were bullish on it here), with good reason. Both films seem to absorb and project the eerie energy of their backdrops, creating claustrophobic terror. However, The Inhabitants also brings to mind films like Ted Geoghegan’s We Are Still Here and, believe it or not, the first V/H/S film (they both make grainy video tape pretty damn blood-chilling). Of course, you can also see stylistic hat-tips to the ambitious low budget horror films of the late 1970s and early 1980s. Everything feels real and hand-crafted. Presumably, any computer generated effects were used sparingly. Fortunately, the Brothers Rasmussen intuitively understand what we do not see is always scarier than what we clearly can (especially if it is cheesy looking). They also created an intriguingly eerie backstory that rings true to local lore. While we’re at it, let’s give Wiley (a.k.a. Bailey) some credit. He’s very well trained and rather expressive for a canine performer. The humans are not bad either, particularly Michael Reed as Coffey, the out his depth everyman. He seems reasonably proactive and intuitive for a horror movie husband, while Judith Chaffee is suitably unsettling as Stanton. Elise Couture-Stone holds up her end well enough, but Jessica Coffey is just the sort of role that demands disciplined consistency rather than method emoting. Perhaps most impressively, the Brothers Rasmussen demonstrate a really strong eye for visual composition. You can tell throughout The Inhabitants that they have carefully determined who and what should be in the foreground and background of each shot. It is a surprisingly well-crafted and satisfying ultra-indie film that deserves a wide genre audience. 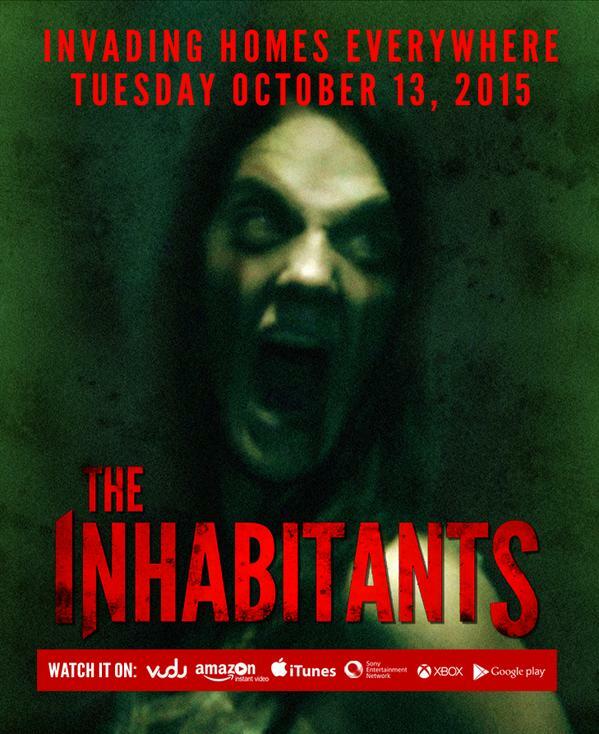 Highly recommended for horror fans, The Inhabitants is now available on most major VOD platforms.